Bleaberry Fell sits at the northern end of the area of high but often rather wet ground that separates Derwent Water and Borrowdale from the Thirlmere valley. The main summit sits in the middle of a large upland area and is fairly quiet, but the eastern and western edges of the fell are lined with crags,and Lady's Rake above Walla Crag is a famous viewpoint for Keswick and Derwent Water, and can get quite crowded. While Lady's Rake provides the best view of Keswick and Derwent Water, the summit of Bleaberry Fell itself provides brilliant views towards the Helvellyn Range, which fills the eastern skyline. The path across the plateau from Cat Gill is fairly dry even when it crosses the otherwise swampy areas, making for a pleasant walk. The northern slopes of Bleaberry Fell are gentle but wet, so the walker willing to risk soggy feet can approach the summit from Castlerigg and Rakefoot without problems. To the south an area of high ground leads on to High Seat. In the east crags and steep ground guard the lower slopes. The main route up Bleaberry Fell comes from the west. Follow the path up Cat Gill until it emerges onto the plateau. Turn right onto a path that branches off from the Walla Crag route and follow it around the eastern rim of Cat Gill's dramatic valley until another path branches off to the left. This path runs all the way to the summit. The summit of Bleaberry Fell sits at the northern end of a ridge of higher rockier and thus drier ground that sits on top of the wet plateau that forms most of the fell. The southern boundary of Bleaberry Fell is formed by Mere Gill in the east and Ashness Gill in the west. Ashness Gill then joins Barrow Beck, which is born close to the summit of Bleaberry Fell and the combined streams run under Ashness Bridge and down into Derwent Water. On the western flank of the fell Cat Gill has a short but dramatic course, dropping down a sizable but rather well hidden waterfall as it leaves Low Moss to enter its ravine and then rush down to the lake. Brockle Beck is born within a few hundred feet of the summit, and heads north across the wetlands of Low Moss before leaving the open fell at Rakefoot where it begins to turn west to head towards Derwent Water. To the north-east a cluster of small streams merge to form Naddle Beck which gathers its waters from Bleaberry Fell in the west and from High Rigg in the east then runs north into the River Greta. 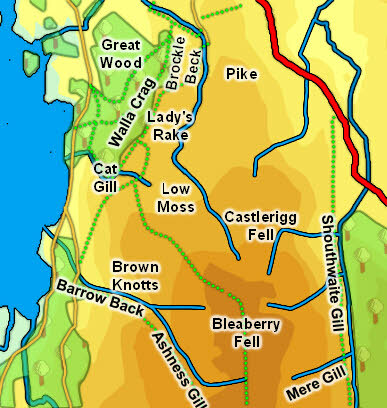 The eastern boundary of the fell is formed by Shouthwaite Gill, which runs almost due north along the boundary between the open fell to the west and the forests that border Thirlmere to the east, forming an almost hidden valley between Bleaberry Fell and The Benn, Sippling Crag, Castle Crag and Raven Crag in the east. Mere Gill and an equally lengthy but unnamed beck both run east into Shouthwaite Gill. Shouthwaite Gill runs north into Naddle Beck, denying Bleaberry Fell any actual footing on Thirlmere. Bleaberry Fell can claim two tiny tarns - Snipeshow tarn at its north-eastern corner and a small tarn close to Rakefoot at the northern edge of the steep ground. Bleaberry Fell's best known features are on its western edge. It can lay claim to half of Ashness Bridge, with its famous bridge (growing trees have rather reduced the impact of this view, but the lake and fell view can be restored by following the path alongside the beck uphill for a short distance). The NT car park at Great Wood provides easy access to a very pretty stretch of Derwent Water. Walla Crag still gets rock climbers and above it Lady's Rake offers a short walk with stunning views of the lake below.